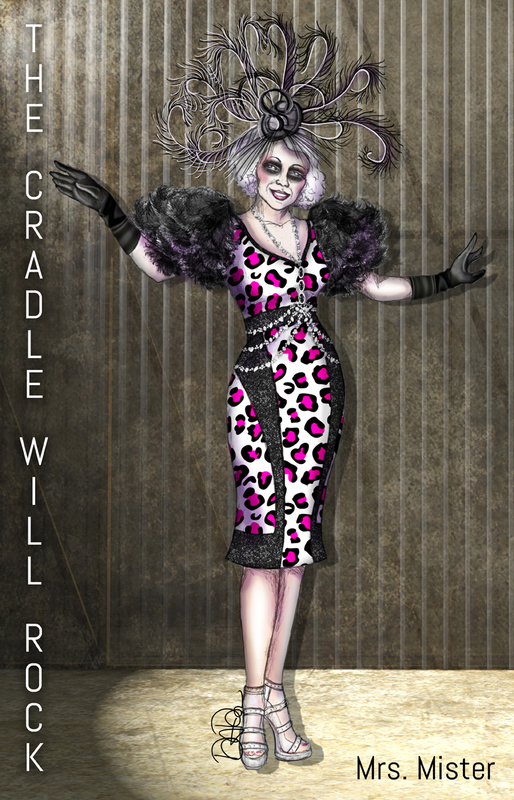 An award-winning new production concept for THE CRADLE WILL ROCK BY MARC BLITZSTEIN, developed by THE LIBERTINE COMMITTEE, a five fingered fist of creative smack-down comprising of ALISON MORITZ, CHARLES MURDOCK LUCAS, DINA PEREZ and KYLE GRANT. (MARC BLITZSTEIN is the thumb). THE LIBERTINE COMMITTEE's exciting new staging for THE CRADLE WILL ROCK was a winner of the 2015 ROBERT L.B. TOBIN DIRECTOR-DESIGNER SHOWCASE sponsored by OPERA AMERICA. MARC BLITZSTEIN forged THE CRADLE WILL ROCK in a very specific political and social context, but the questions it raises regarding economic power, class structure, agency, hypocrisy, and opposing forces remain as urgent today as they were in 1937. Presenting opera in 2015 is a socially relevant act, and our concept engages the audience in contemporary moral debate. Rather than accusing or lecturing, we use humour and 1930s musical theatre traditions to reveal the struggles of social exploitation, inviting the audience to raise their voices. Larry Foreman urges, we stand stronger together than we do apart, like fingers closing to form a fist. Our production concept, inspired by this metaphor, include a set composed of disparate elements that break apart and reconfigure into different locations in Steeltown, USA. By exposing parts of the performance experience that are typically hidden, we reveal class structure and invite the audience to reconsider their role as spectators. Above all, this is a world of contemporary archetypes, with characters and social structures immediately recognizable and relatable to modern audiences. Stage Director Alison Moritz's current season includes directing productions of Die Zauberflöte for Opera Memphis and the Orlando Philharmonic, assistant directing at Seattle Opera and Opera Theatre of St. Louis, and guest teaching at the University of Maryland's Maryland Opera Studio. Along with the design collective The Libertine Committee, Alison was named one of the 2015 winners of the OPERA America Director-Designer Showcase for her team's concept proposal for Marc Blitzstein's The Cradle Will Rock. Her recently received the SDCF Kurt Weill Fellowship for 2015-2016, and her future projects include a new production of The Hobbit for Tulsa Opera. Alison spent the 2014-2015 season as the Resident Assistant Director at the Minnesota Opera, where her projects included assistant directing new productions of Hänsel und Gretel, Carmen, and the world premiere of The Manchurian Candidate. Other recent assistant directing highlights include engagements at Opera Theatre of St. Louis, The Atlanta Opera, Wolf Trap Opera, and Chautauqua Opera. From 2012-2013, Alison served as interim faculty at Eastman School of Music, where she taught acting for opera singers and directed both mainstage operas and scenes programs. Original productions for Eastman School of Music include Handel's Orlando, Il matrimonio segreto, Venus and Adonis, and The Last Five Years. See production presentations from the most promising young director-designer teams and meet the artists who created them. The Robert L. B. Tobin Director-Designer Showcase is a biennial competition that identifies emerging director-designer teams, each of which has developed a production proposal from a diverse list of American operas. Opera Conference 2015 in Washington, D.C.
New York, NY – OPERA America is proud to announce the 2015 finalists of the Robert L.B. Tobin Director-Designer Showcase, a biennial program offered as part of OPERA America’s continuing effort to foster emerging opera artists. The showcase, made possible through support from the Tobin Theatre Arts Fund, was established to bring promising talent to the attention of the field and connect these directors and designers with those who are in a position to advance their careers. Forty applicant teams of directors and designers each created a production concept for an American opera, chosen from a diverse, curated list. As part of the application process, each team submitted a production concept that included visions for staging, scenery, props, costumes and required personnel. This concept presents The Cradle Will Rock as modern music-theater, not a footnote in the history of 20th-century theater or dated agitprop. The team’s staging uses functional tools to cut artifice and ask big questions: For whom do the people work? Who does the engine of labor serve? These four production designs were selected by panelists Izumi Ashizawa, director and producer; Todd Hensley, lighting designer and theater consultant, Schuler Shook; Drew Landmesser, deputy general director, Lyric Opera of Chicago; Tobin Ost, scenic and costume designer; and David O. Roberts, costume designer. As opera is an intrinsically collaborative art form, the projects chosen were selected not only because they demonstrate the requisite creativity and skill, but because they display true collaboration, creative vibrancy and collective passion. The finalist teams will each be given $2,000 to be used toward further research and the production of more comprehensive renderings and models. Each team will also be mentored by one of the panelists as they prepare the final presentation of their designs. Up to two representatives from each team will be provided with transportation, lodging and registration to attend Opera Conference 2015 in Washington, D.C, where they will present their proposals to opera producers at a special live-streamed session as well as network with conference attendees. 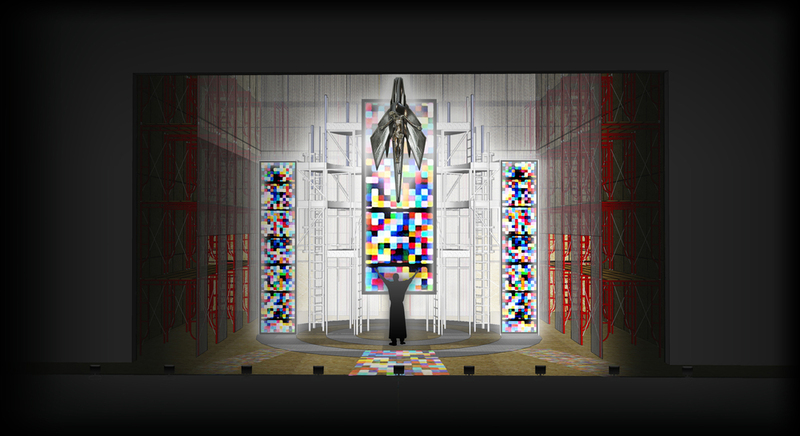 At the most recent Director-Designer Showcase, held in 2013, over 80 opera producers attended the presentation and more than 18,000 viewed the live stream. Over the next two years, each team will also have their designs featured in a six-month exhibition at the National Opera Center in New York. Director Walker Lewis, one of the 2013 finalists, stated, "Presenting our work at Opera Conference 2013 provided the opportunity to meet so many opera professionals face to face, forming important relationships that I can now strengthen and nurture for years to come. That experience gave me the confidence to continue expanding my circle of opera colleagues and to think more creatively and boldly about possible opera projects," he continued. As a direct result of their Showcase experience, members of the 2013 finalist teams received engagements with member opera companies, including Amarillo Opera, American Opera Projects, Gotham Chamber Opera, Music-Theatre Group, Opera Columbus, Opera North, Opera Philadelphia and Opera Theater of Pittsburgh. These finalists have also since worked with Central City Opera, Edinburgh Fringe Festival, Labyrinth Theater Company, NBC (for the telecast of the Sochi Winter Olympics), Pittsburgh Opera, Second Stage, Tulsa Opera and on various film and television projects. "OPERA America is uniquely positioned as the field’s convener and connector to advance the careers of the most talented creative artists," stated Marc A. Scorca, president/CEO of OPERA America. "The Robert L.B. Tobin Director-Designer Showcase enables us to support the career development of stage directors and designers and, through them, further the artistic development of the opera form." Founded in 1970, OPERA America's worldwide membership network includes nearly 200 Company Members, 300 Associate and Business Members, 2,000 Individual Members and more than 10,000 subscribers to the association's electronic news service. In response to the critical need for suitable audition, rehearsal and recording facilities, OPERA America opened the first everNATIONAL OPERA CENTER (operaamerica.org/OperaCenter) in September 2012 in New York City. With a wide range of artistic and administrative services in a purpose-built facility, OPERA America is dedicated to increasing the level of excellence, creativity and effectiveness across the field. OPERA America’s long tradition of supporting and nurturing the creation and development of new works led to the formation of The Opera Fund, a growing endowment which allows OPERA America to make a direct impact on the ongoing creation and presentation of new opera and music-theater works. Since its inception, OPERA America has made grants of nearly $13 million to assist companies with the expenses associated with the creation and development of new works." Yesterday Corinne Hayes called us to action with an exciting look at The Cradle Will Rock. Today will look at a different way this explosive piece questions our notions of power and gender. Director Alison Moritz is currently the Resident Assistant Director at Minnesota Opera. She has also served on the directing staffs at Wolf Trap Opera Company, Opera Theatre of St. Louis, Atlanta Opera, and Chautauqua Opera. Together with set designer Charles Murdock Lucas, costume designerDina Perez and lighting designer Kyle Grant, Alison formed a team to look at this list of American operas. Here she discusses the collaboration. Almost immediately, our team discovered a mutual drive to engage with the world through art that speaks to our own political and social experiences, and we spent a lot of time considering each opera and its relevance today. We were struck by the timeliness of Marc Blitzstein's The Cradle Will Rock, a work that felt uncannily apt given the context of this summer’s labor disputes at the Metropolitan Opera. 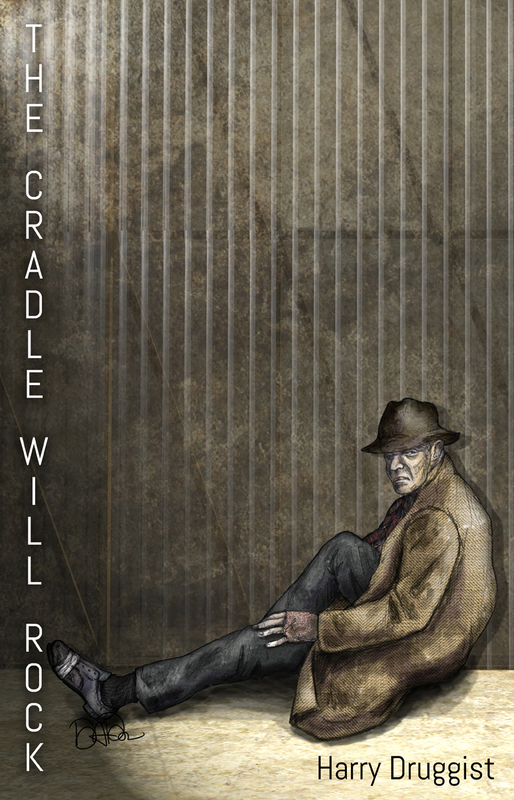 The Cradle Will Rock is structured as a series of flashbacks and vignettes, exposing the members of a so-called Liberty Committee in Steeltown, USA. One by one, we learn how the pillars of the community (including leaders of the church, newspaper, education, arts, and medicine) fell under the sway of Mr. Mister's empire, selling themselves for power and prestige and ultimately becoming part of a societal machine that treats the working class as disposable. I won't go into the specifics of our production concept here, but there's one detail of our concept which I believe is germane to the discussion at hand this week at Opera Think Tank - Idea Power from Women. 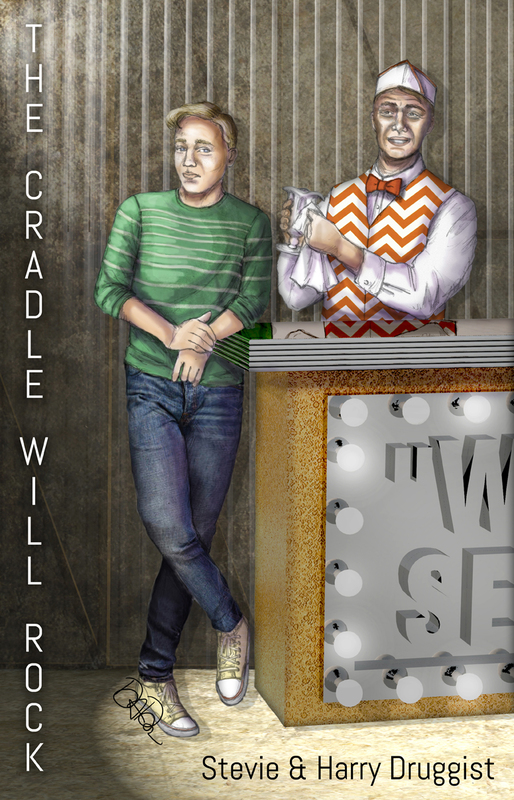 As a team, we wanted to bring The Cradle Will Rock into the 21st century. After some discussion, it became apparent that we could not imagine a millennial Liberty Committee without a single female member, so we decided to recast the role of Editor Daily as a woman. Casting a female Editor Daily requires very few changes to the existing text, but it creates a series of subtle but important realignments in the power dynamics of the opera...."
On the surface, Marc Blitzstein’s The Cradle Will Rock might appear to be an opera about unions and unionism. But, as the composer himself pointed out, the work squarely addresses trials faced by the middleclass and raises questions regarding economic power, class structure, hypocrisy, accountability, and social agency that remain urgent today. Many previous performances of this opera have used minimal sets and props to reflect the legendary circumstances of the renegade premiere at the Venice Theatre in 1937. Our team recognizes the need for a full-scale production that presents The Cradle Will Rock as modern music-theatre, not as a footnote in the history of 20th century theatre or dated agitprop. We propose a staging using modern, functional, and unpretentious tools to emphatically and forcefully cut through artifice and tradition in order to ask big questions: Who do the people work for? Does the engine of labor serve the many, or just the one? Is the selling of one’s efforts ever honorable or respectable? Our proposal for The Cradle Will Rock is designed specifically to emphasize the prescience of Blitzstein’s 1937 version - we imagine it performed uncut, with his original orchestrations, and without an intermission. We share Blitzstein’s sentiment, expressed in his program notes when the opera was presented at the New York City Opera in 1960: “Let it take its chances... let it prove whether it remains an engrossing and entertaining musical stage piece.” Our team is convinced that a modern production of this opera can be built upon the scaffolding of the original text and music. By stripping away the period facade of its premiere, we hope to reveal the relevance of the work as it stands today. 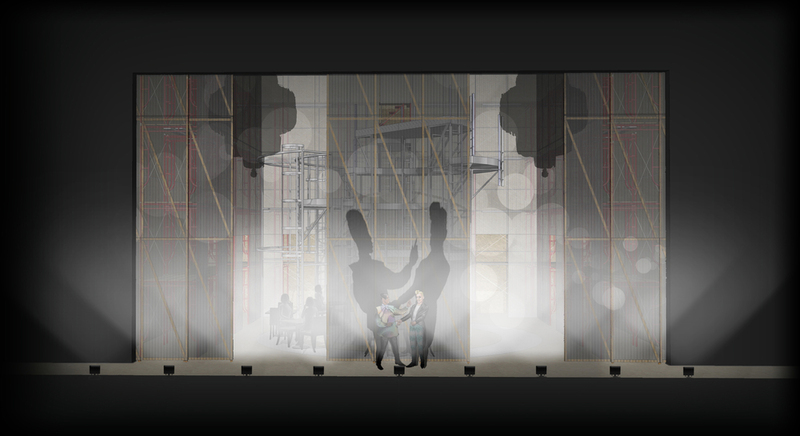 The scenic design is a machine made to reflect the layered structure of society that is powered by the engine of labor. The central engine of the machine was inspired by towers as symbols of power, and images of abandoned steel mills. Like Blitzstein’s music, the scenic environment is about function, first and foremost. The different levels of scaffolding represent the precarious stratification of class structure and the materials are utilitarian, with an emphasis on the real. For example, the central engine is housed in a surround constructed of OSB plywood, a inexpensive engineered material made of millions of small pulverized pieces of wood combined to make a strong and complete whole. The surround is clad in clear Corrugated Fiberglass Panels and commercially available scaffolding supports it all. The engine itself made of steel, built in two semicircular halves that rotate independently and reconfigure to form different locations in Steeltown, USA - from the massive factory of labor that functions like a treadmill, to a three story swimming pool for Mr. Mister’s home. The two concentric ring turntable system, with walkable and climbable structures on top, is operated a vista by the workers. By exposing this part of the performance experience that is typically hidden, we display the physicality of work as a theatrical and meaningful event. Down to the last detail, the design and materials of the set confirm the core values reflected in THE CRADLE WILL ROCK. Contact me for more technical specifications here. Costumes define a cast of satirical archetypes instantly recognizable to modern audiences, providing visual equivalents to Blitzstein’s naming devices. The characters’ names are their professions and, overall, costumes are used to reflect two different ideas of the modern “uniform.” A uniform can define and label an individual as unique (exemplified by the Liberty Committee and Mr. Mister’s corruption), or allow an individual to identify with and assimilate into to a united group of people (Larry Foreman and the Union Workers). To make the characters more relatable, the costumes combine contemporary clothing with period influences as seen in garment research, make-up, hair, and styling. They are undeniably modern, though reminiscent of an earlier era during which the narrative takes place. Characters who have sold out to Mr. Mister, whether they are actively seeking or complacently participating in luxurious kickbacks, are influenced by high fashion. Their corruption is represented through artificial structure and silhouettes, graphic prints, and saturated colors. Those characters also have stylized make-up that darkens and hollows their eyes, an idea that references 1930s photographs and communicates that they have sold their soul and moral values away to Mr. Mister. In contrast, the uniforms of Larry Foreman, the Union Workers, and other characters in that social class are functional and well-worn, without the artifice of structure or color. They wear earth-toned, utilitarian clothing that harkens back to workwear of earlier decades. Caught between the two worlds, the protagonist Moll incorporates elements of both - while her styling refers to the visual language of Mr. Mister and the other sellouts, her clothing reminds us that she comes from the workaday world of Larry Foreman. She provides the audience with a way into this world of corruption. Alongside Moll, the audience discovers Mr. Mister and his sleazy machinations. illuminates the action in the stark, revealing light of truth, exposing the artifice of performance while serving as a reminder of the vaudevillian and burlesque heritage of the opera. 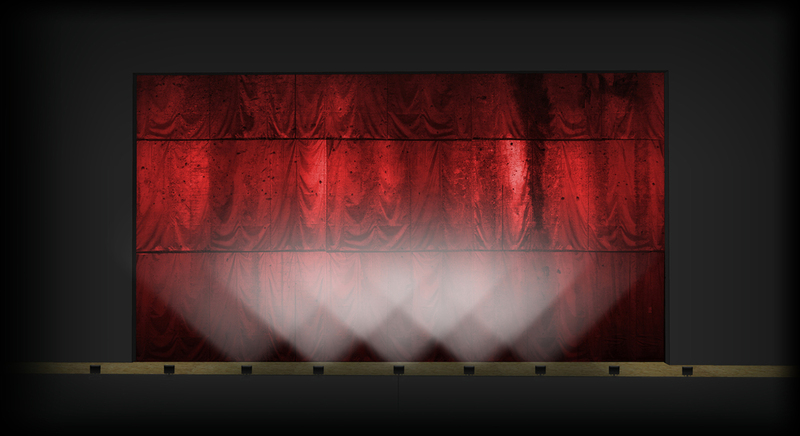 Other practical lights built into the set perform important narrative functions. Inspired by Amsterdam’s red light district, neon “Prostitution Lights” turn on to create holding cells in the scaffolding of the Nightcourt and draw a visual parallel from Moll’s prostitution to the selling of the self that marks the members of Mr. Mister’s Liberty Committee. For the scenes set in the Nightcourt, a fluorescent light bank with embedded lights flies in to create an oppressive bureaucratic environment, and a tremulous glow reveals the action below, while the shadow of the social engine looms overhead. 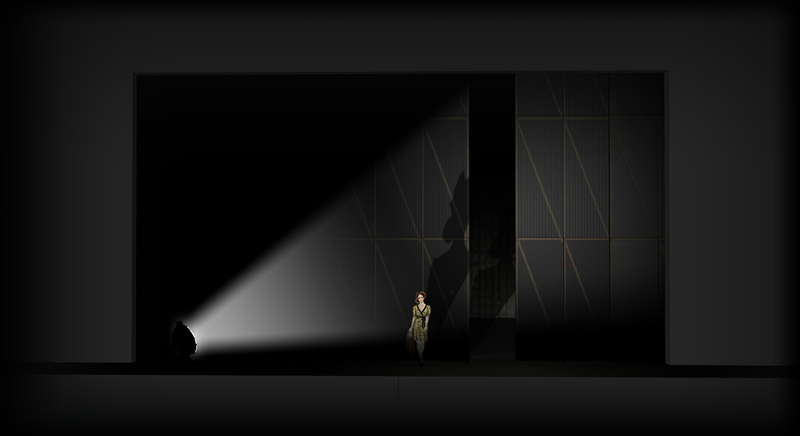 Light carves out the literal machine onstage, revealing its teeth for the first appearance of Larry Foreman after Moll’s fervent recognition of “Nickel Under the Foot.” Throughout the entire opera, the lighting focuses on the costumed crew rotating and reconfiguring the central machine, transforming each scene shift into a broader metaphor of man at work. As one scene transitions into the next, the lighting indicates changes of time and space, evoking cinematic effects to create the vignettes, crossfades, jump cuts, and split screen effects implied by the composer in both the score and libretto. Do you have something important to say about this show, this movement and these issues? 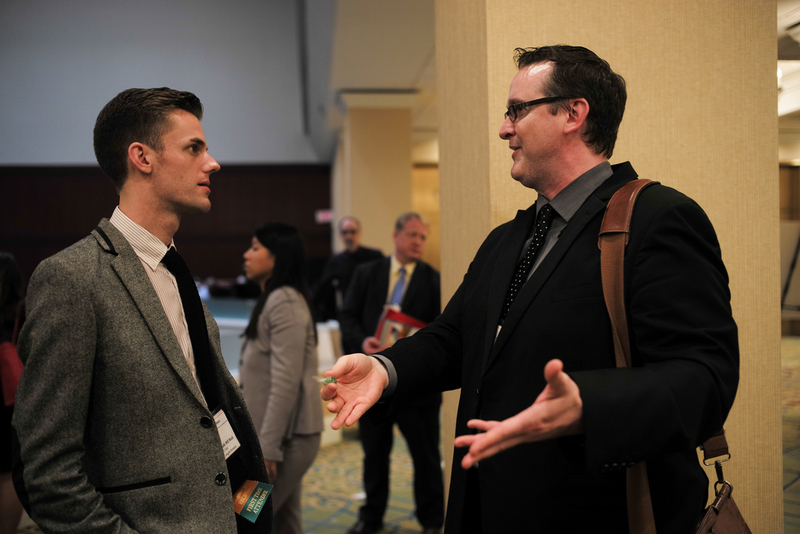 Photo Credits: Opera Conference 2015: Increasing Civic Impact, May 6–9, 2015, at the Washington Marriott Georgetown. Photos by Jati Lindsay, courtesy of OPERA America. Join the creative team behind a new production of The Cradle Will Rock as they unveil their award-winning directorial and design concept at the National Opera Center, as part of the 2015 Robert L.B. Tobin Director-Designer Showcase. Come celebrate the New Year with colleagues, meet the artists, and help kick off the New Works Forum 2016! all material here copyright 2014-2016 Alison Moritz, Charles Murdock Lucas, Dina Perez, and Kyle Grant, unless otherwise noted. Nothing may be re-used here without express permission.